For those who don’t know: An auto-flowering marijuana plant automatically starts making buds about 3-4 weeks from germination, and most plants are ready to harvest by the time they’re 3 months from seed. Auto-flowering strains produce plants that are ready to harvest earlier than almost every “regular” (photoperiod) strain and don’t need special light schedules. You generally only get auto-flowering seeds from a reputable breeder. A Sweet Afghani Delicious (S.A.D.) Auto at 5 weeks old and 15″ tall – just a week away from harvest! The quick-yet-bountiful harvest is one of the biggest benefits of growing auto-flowering marijuana plants. However, the shortened vegetative stage brings up an important question. Generally, when growing “standard” (photoperiod) strains, indoor growers use plant training methods for the first 4-6 weeks of a plant’s life to make plants grow flat and maximize yields in the flowering stage. 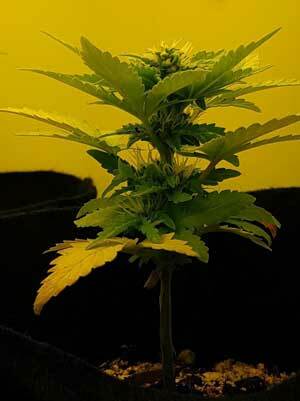 Can auto-flowering plants be “trained” in their short vegetative stage? And if they can be trained, does it actually provide any benefits? The short answer is “yes” to both questions (with one caveat)! 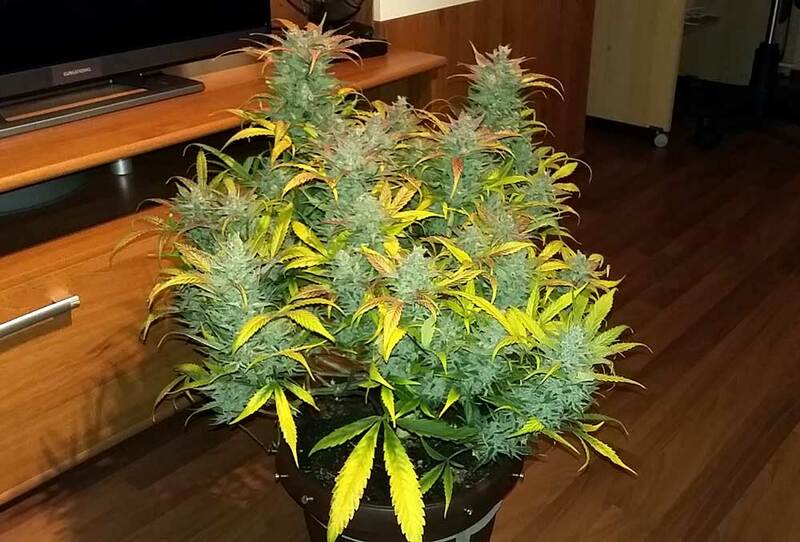 This gorgeous Hubbabubbasmelloscope auto-flowering plant was topped at a young age by a talented grower called awolace (who has many great grow journals on auto-flowering plants) and produced 4.75 ounces by itself. Auto-flowering strains can be trained to produce more and bigger colas, and proper plant training can increase yields and overall improve your grow results. Auto-flowering strains from a decade ago were heavily hybridized with wild hemp and produced small and subpar quality flowers. However, modern auto-flowering strains from trustworthy breeders (like this Auto Lemon OG Haze plant from breeder Nirvana) produce buds that are just as potent and beautiful as traditional photoperiod strains. 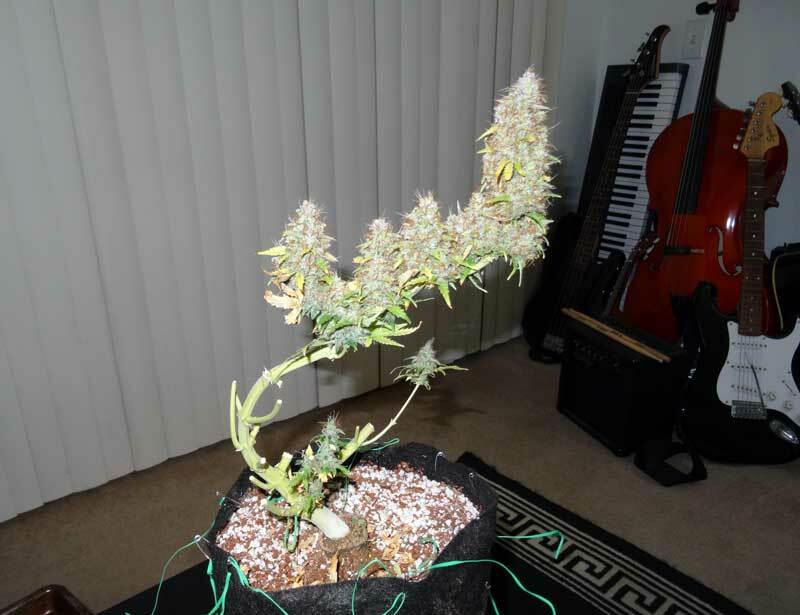 No Training at All – Since autos only stay in the vegetative stage for a few weeks, if you stress your plant too much with extensive training, it may end up stunted. 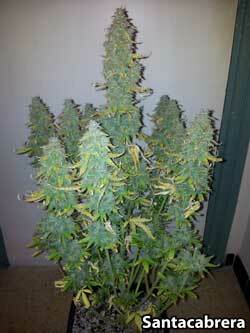 A stunted auto-flowering plant produces very low yields. As a result, many growers recommend no training at all when it comes to auto-flowering marijuana strains, just to be safe. Untrained plants still produce a lot of bud! Low Stress Training Only (Bending) – The idea behind low stress training is to force the plant into the flat shape you want by bending all new stems and tying them down. The advantage of sticking only to bending is it’s very low stress (hence the name) on the plant. There’s basically no chance of stunting from simple bending. 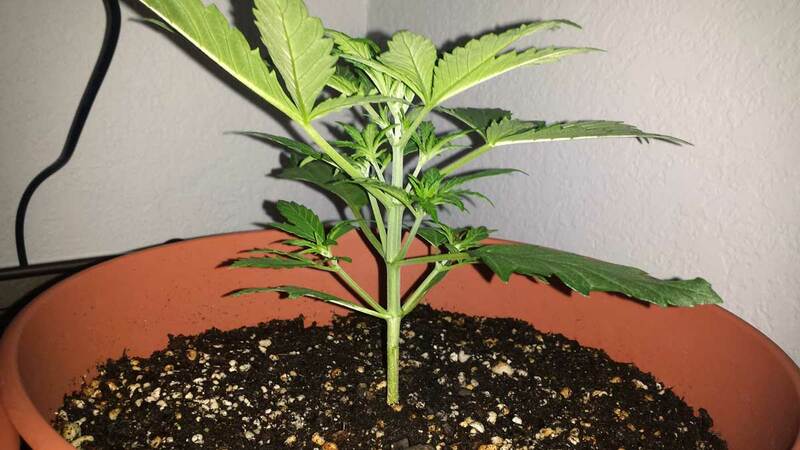 However, with LST you don’t have the same full control over the plant’s shape as you do when you actually “top” the plant (split the main cola into two), which makes it very easy to grow a wide and flat plant. 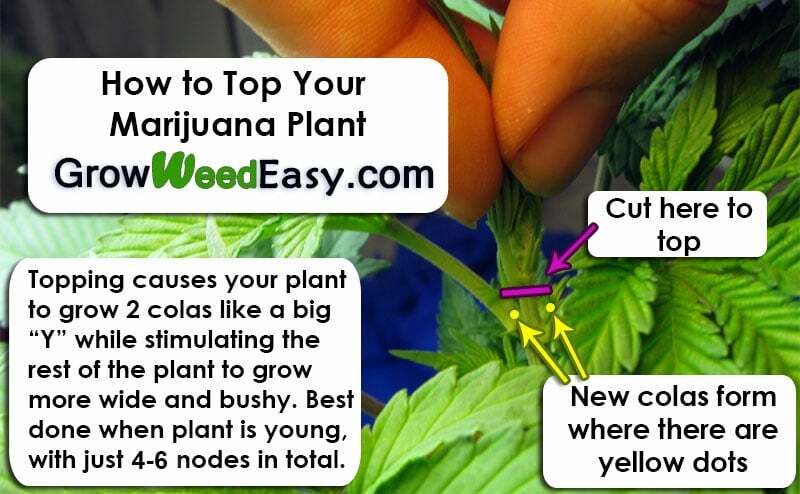 “Top” the Plant in Addition to Other Training – Modern auto-flowering strains often respond well to “topping”. This is when you cut off the very top of the main stem when the plant has only a few nodes, so that it grows two main stems instead of just one. This makes it easy to spread out the plant under the light. Topping usually won’t stress your plant if it’s healthy and fast-growing, but it’s possible that topping may contribute to stress or stunting if your plant is slow growing or sickly. 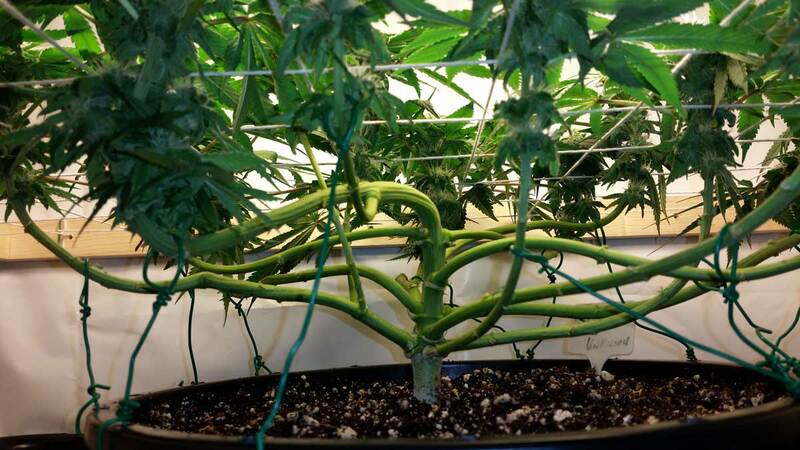 Most growers agree you don’t want to do aggressive training on an auto-flowering plant, for example you probably wouldn’t want to make a full manifold, which takes several weeks in the vegetative stage to set up. 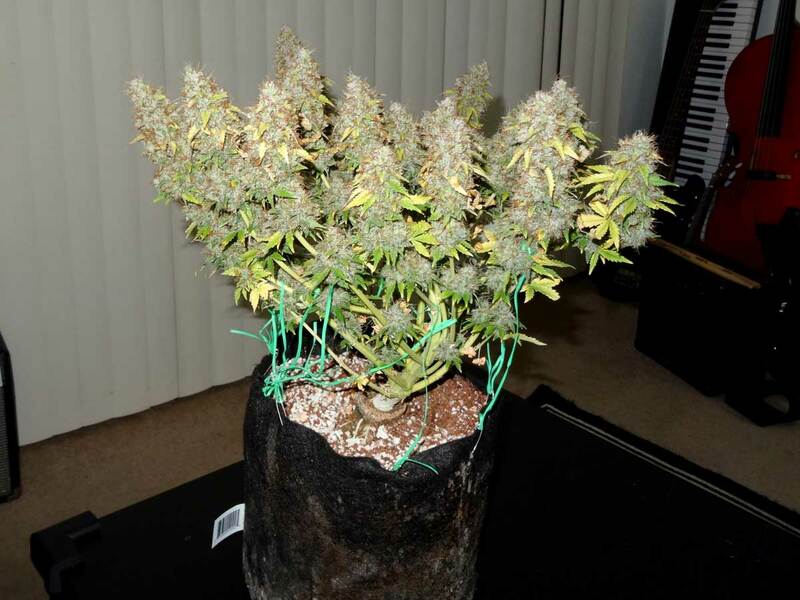 Though there are exceptions, you usually don’t have enough time in the vegetative stage to take full advantage of that kind of training technique with auto-flowering plants. 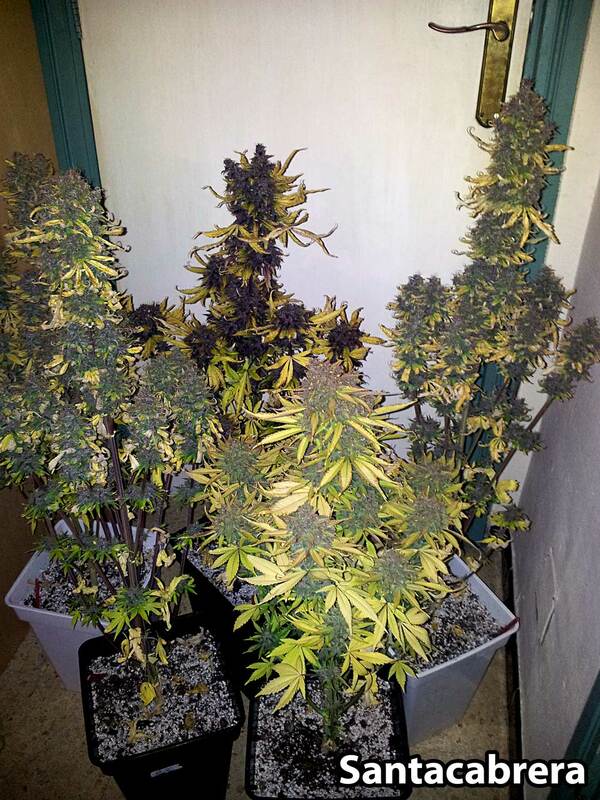 These auto-flowering plants were stunted when they were young by heat and overwatering. Now they’ve already started flowering and are just a few weeks from harvest. Even though they have a plentiful amount of light, at this point the plants are not going to get any bigger no matter what the grower does because the vegetative stage is over, and the flowering stage is already under way. Here’s a closeup of the middle plant. You can see by the bud development that it’s just a few weeks from harvest. Since it’s this far into the flowering stage, you know that the plant is not going to get any bigger. 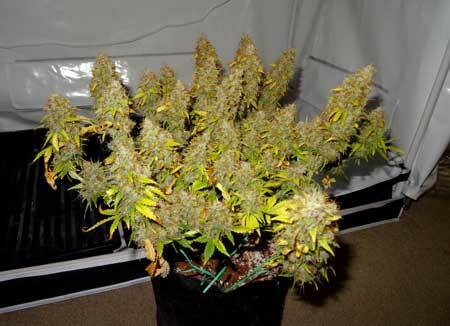 The buds will fatten up, but even if they tripled in size, the grower would only get a few grams of bud. The plant just isn’t big enough to support bigger yields. 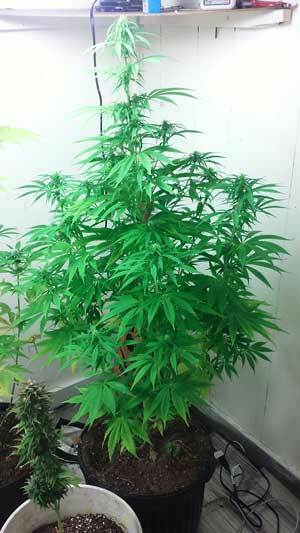 Here are examples of untrained auto-flowering plants. With good care and a lot of light, they can produce a whole lot of bud without any training, especially the medium to tall strains! 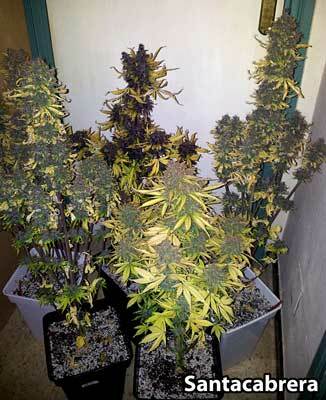 These 5 auto-flowering plants were started at the same time. 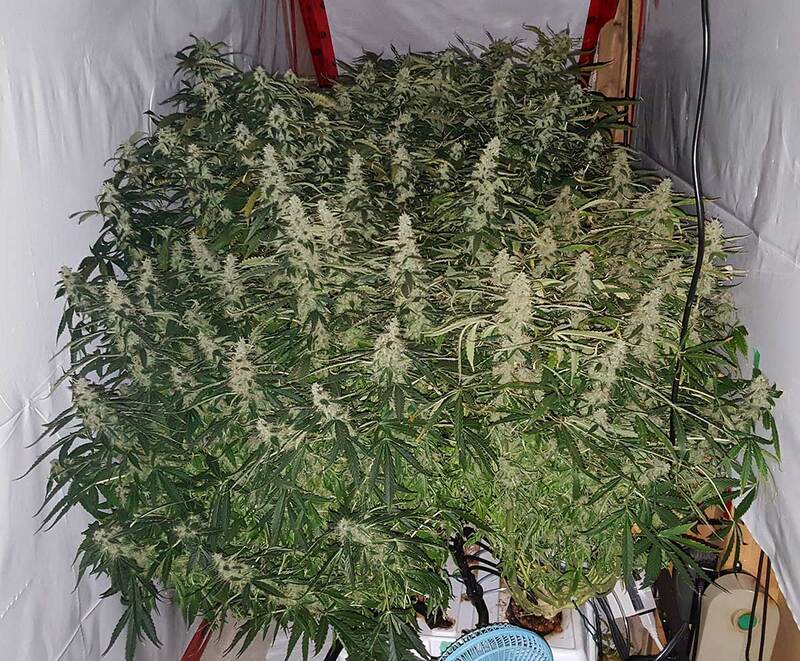 Without any training, they grew into this sea of buds at harvest! Growing many untrained plants together can be one of the easiest ways to get to a quick, hefty harvest. This style of growing is known as Sea of Green and is very well suited to auto-flowering strains. 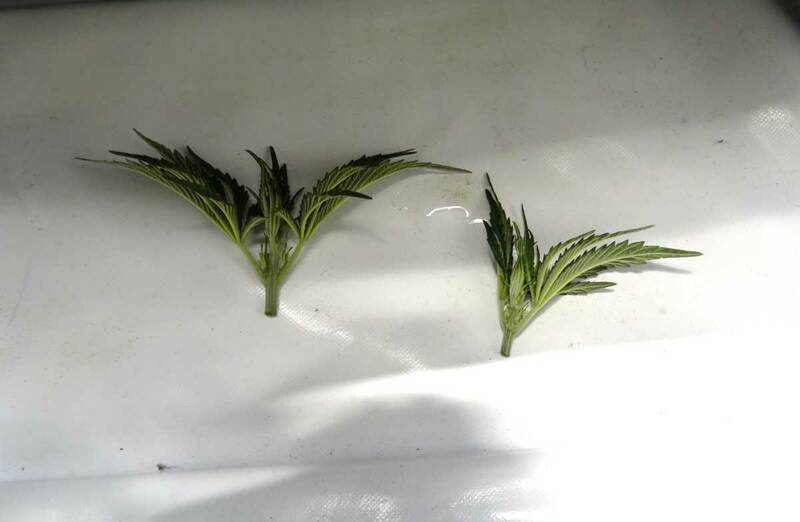 Here’s an example of LSTing an auto-flowering plant by bending over the main cola when it was young and still mostly in the vegetative stage. This auto also wasn’t topped. I only used bending and securing to try to keep it wide with many colas. I was happy in the end with the shape, but it was a big pain trying to keep it flat. It’s just a lot easier to keep plants flat when you top them, since it splits them and you can lay each side flat. 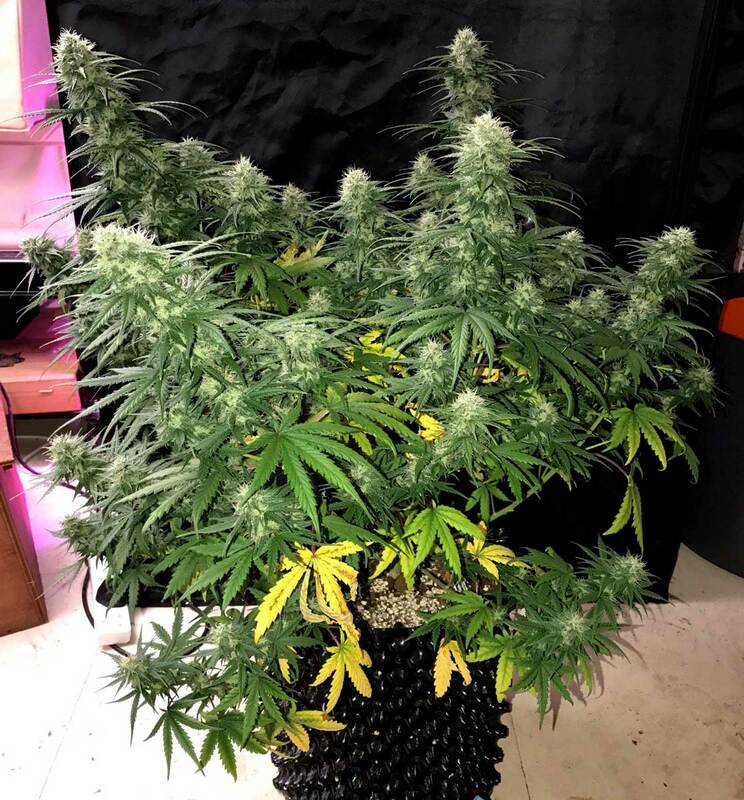 An auto-flowering Super Skunk plant just before harvest – this plant spent a little over 2.5 months under a Mars LED grow light. A view from the side of the same plant. Only LST/bending was used to keep it short and wide, and as a result you can see there’s still one dominant cola higher than the rest, even though the plant has been completely bent over. If you cut off the very top of a young, fast-growing auto-flowering plant, it may not even notice. 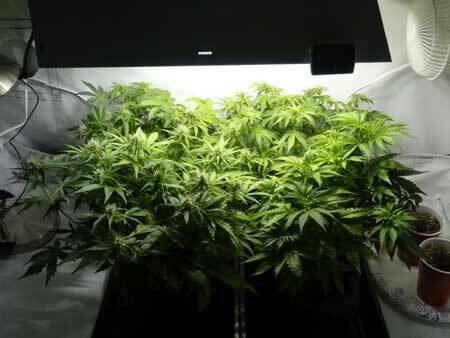 Many growers recommend against topping an auto plant because stress can stunt your plant. 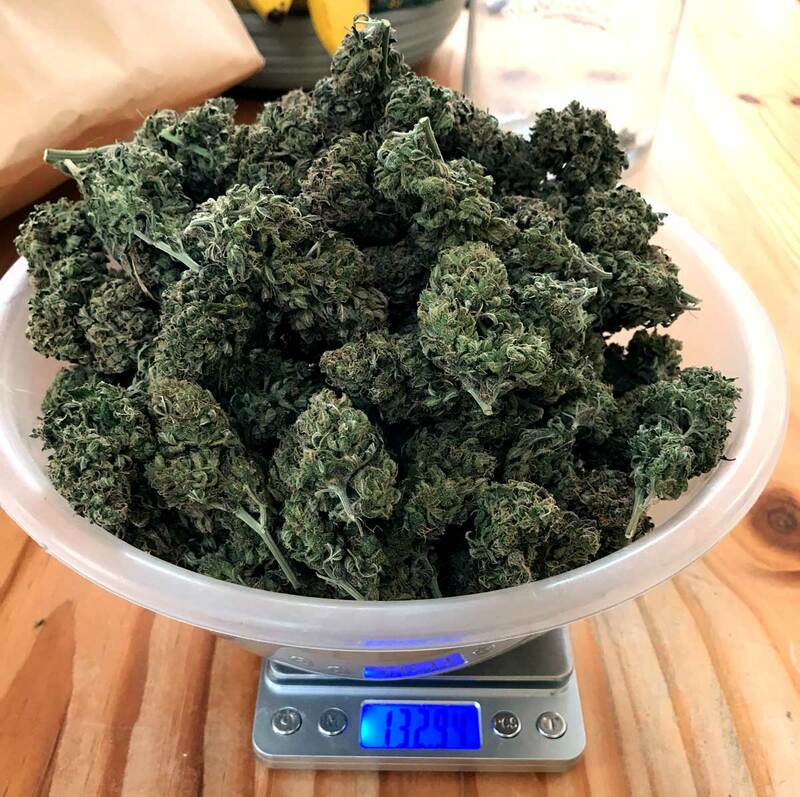 While you definitely want to avoid stunting, I personally think topping autos works well as long as you make sure your plant is healthy and fast-growing first. To be honest, other factors like overwatering or a poor environment seem to be much more likely to stunt an auto-flowering plant than topping, especially if you’re cutting off just the very tip of the plant without removing much plant matter. 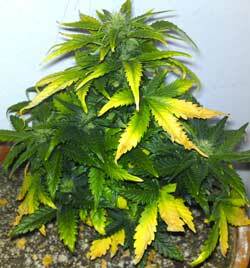 Overwatering or a poor environment is far more likely to stunt an auto-flowering plant than a simple topping. For example, this auto-flowering plant was stunted due to overwatering and heat. I’ve seen that many growers in our forum (check out photos from Green75 for some great examples!) 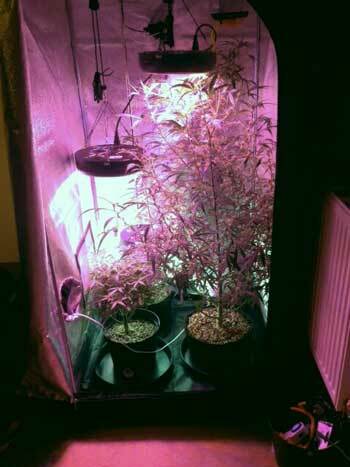 have gotten great results topping their auto-flowering plants. I’ve also seen many growers (myself included) get incredible results with either no training or just low stress training! So, I definitely think you can succeed with any training style as long as you listen to your plants! 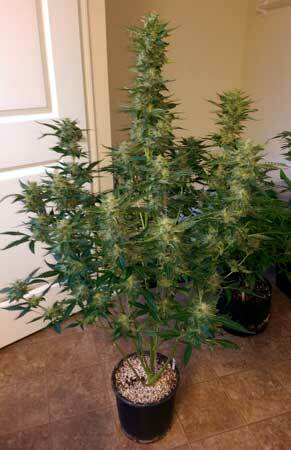 This Auto Amnesia Haze plant was topped, trained and defoliated. It already has a sea of buds with a month left to go until harvest! When is the best time to top an auto-flowering cannabis plant? 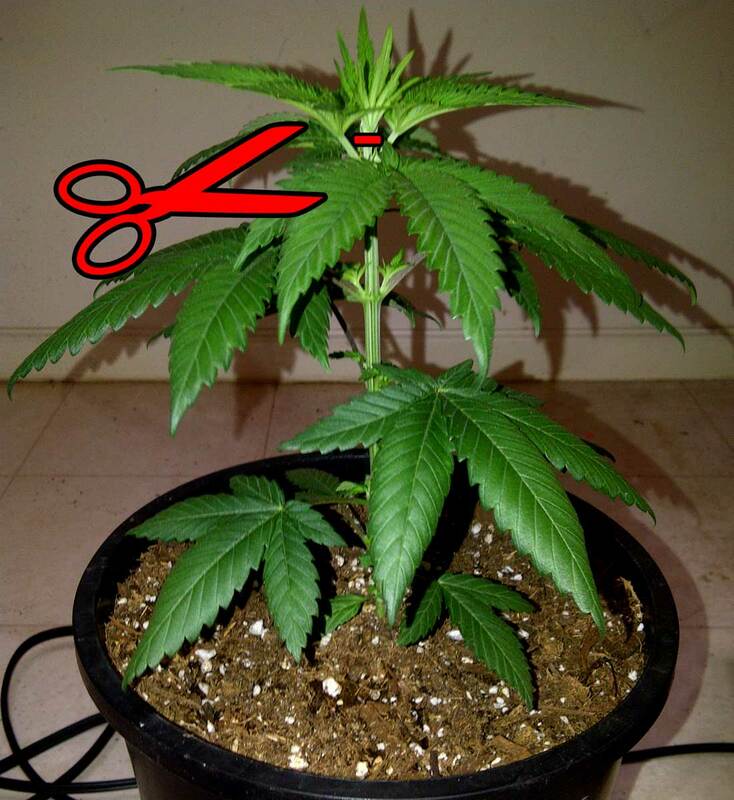 Although you can top a plant any time it is still in the vegetative stage, I believe you will get the best results by removing the 3-5th node while it’s still tiny, as long as the plant is fast-growing. I think one of the most important things to avoid stunting is to remove as little as possible. The less you remove, the less the plant will notice. I personally wouldn’t cut off more than this when topping an auto-flowering marijuana plant. You could even have pinch the stem off a little higher, above those two baby fan leaves. 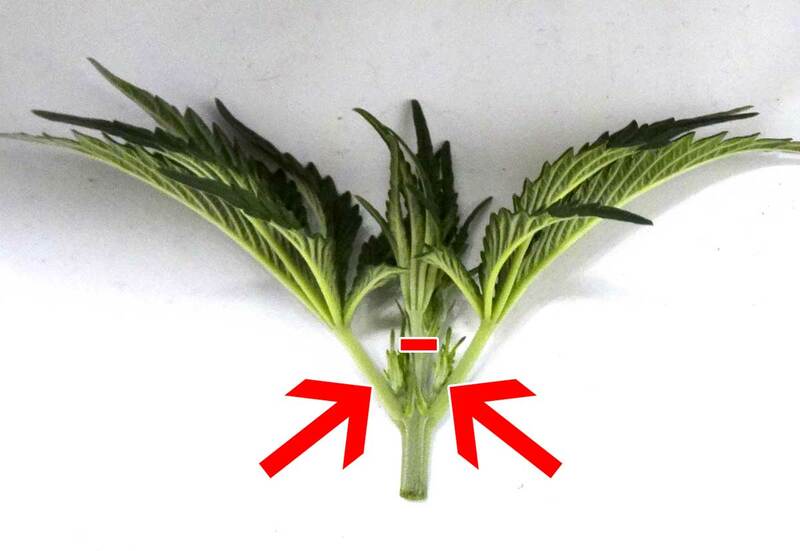 The arrows point to the two growth tips that would be the new “tops” if you had cut where the red line is. In this case, you would have removed even less from the plant, reducing the chance of stunting even more, and helping your plant keep as much growth as possible. This diagram shows where to cut for topping, along with where to expect the new main stems. 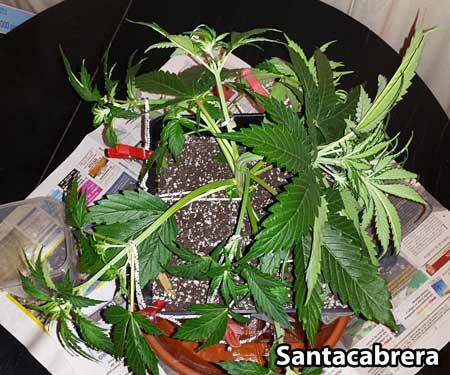 When is it a Bad Idea to Train an Auto-Flowering Plant? Auto plants are on a very tight time schedule in the vegetative stage, and therefore plant training isn’t necessarily the best idea for plants that are already sick or stunted since they likely won’t have time to recover. With an auto-flowering strain, you generally have about a month to create the main shape of the plant. After that it will start flowering and although it will continue getting taller, you want to let the plant focus on fattening the buds as opposed to a whole lot of further training. If you’re not sure whether to top your plant, it’s recommended to stick to bending as it can achieve similar results without any risk of further stunting your plant! That being said, almost every other plant training method (topping or FIMing, low stress training, supercropping and Sea of Green) can be used on auto-flowering plants as long as you watch the plant closely for signs of stress and make sure you let the plant get big enough to produce good yields in the flowering stage! Whether you grow in soil, coco coir, or a full hydroponic setup, auto plants often tend to prefer relatively low levels of nutrients compared to many other cannabis strains. When it comes to adding extra bottled nutrients, start at 1/2 strength of the recommended dose or less, and only add higher levels of nutrients if needed. In hydro use “vegetative” nutrients until you see “budlets” (little bunches of white hairs) which is often around 4-5 weeks. In good soil, you don’t need to add any nutrients during the vegetative stage. 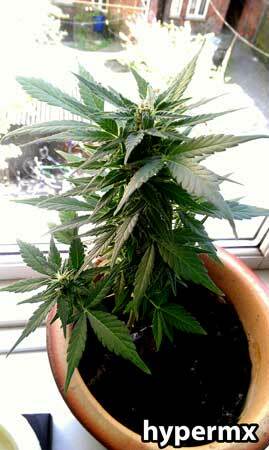 After the first signs of buds, start adding “flowering” nutrients at very low strength (1/2 strength to start). Potted auto plants tend to do best in an airy potting mix with lots of drainage (plenty of drainage holes, and something like perlite to help add more drainage to your growing medium). This helps makes sure roots get plenty of oxygen so plants grow as fast as possible. With any soil mix, it’s recommended to have about 20-30% extra perlite for increased drainage. 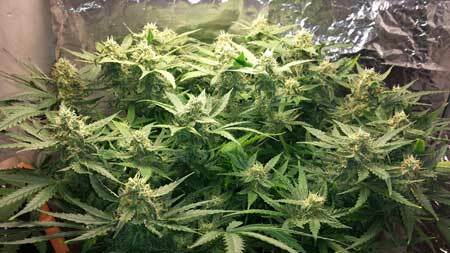 The final size of your auto plants is largely dependent on the strain you get. Some strains, such as Lowryders, have been bred to grow extremely short – less than 1-2 feet. Other strains can grow taller, up to 4 feet tall or even more. Although most auto strains start flowering at just 3-4 weeks, some strains take up to 8 weeks (or even longer) to auto. Often, long-flowering auto strains are labeled as “Super Autos” or “XXL” but you should still read the breeder description to fully know what to expect as far as timelines and height. If you have a plant that is not “auto-ing” as soon as you want, you can put it on a 12/12 light schedule and it will usually start flowering in 1-2 weeks just like a photoperiod plant. These two auto-flowering plants are the same age and were grown in the same setup! Genetics makes a huge difference to your final results, so it’s important to pick the right auto-flowering strain! The small plant is White Widow Auto & the huge plant is Onyx Auto. 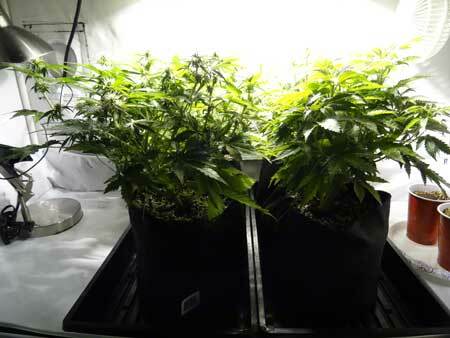 These two auto-flowering plants are also the same age and grown in the same environment. The small plant is Auto Chemdawg & the huge plant is Super Lemon Haze Auto. As a general rule of thumb, auto plants tend to double or triple in size from when they first start showing signs of flowering/budding (usually when plants are about 3-4 weeks old from seed). An auto-flowering plant is usually “full size” at just 6-7 weeks from seed! For example, these autos are 6 weeks old and didn’t get any taller, even though buds are still fattening and harvest is still several weeks away! 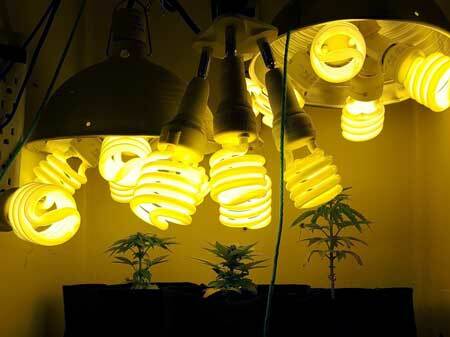 Plant training is a tactic that helps cannabis growers increase yields indoors by exposing more buds to strong, direct light from the grow light. Which breeders can you trust for good auto-flowering marijuana seeds? These auto breeders have dedicated themselves to developing auto-flowering strains in particular, and have gained popularity for their consistency and quality. 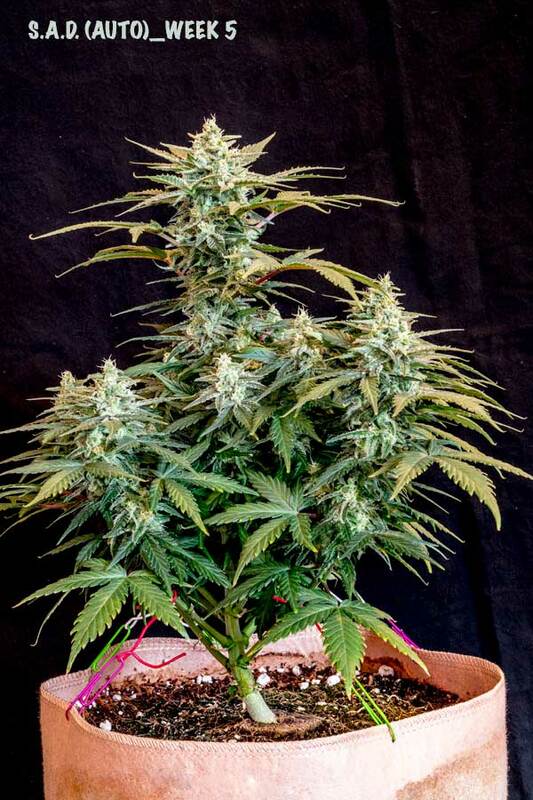 ​There are many other breeders that offer auto-flowering seeds, but the breeders listed have become famous for breeding some of the best auto seeds when it comes to ease of growth, potency and yields. Let us know if you believe there’s an auto-flowering cannabis breeder we should add to this list! Dinafem was one of the first breeders to go “all in” for auto-flowering strains when they started a comprehensive breeding program several years ago. Their award-winning Auto Sour Diesel strain produces average looking buds, but the strain was easily one of the most potent autos I’ve grown. In fact, every auto strain I’ve grown from Dinafem has produced above-average quality buds in smell, appearance and potency. Auto Sour Diesel – bud look average but bud effects are unique and powerful! Nirvana has several popular auto-flowering strains, but their latest auto strain Auto Lemon OG Haze has been getting some especially impressive results in bud quality, with a nice appearance, high THC and a medium amount of CBD. Their Auto Northern Light is another popular strain, especially with first-time growers, because it has a relatively low smell and is known for being easy to grow with good yields. Sweet Seeds is known for colorful auto strains that are easy to grow, like their Dark Devil Auto and Black Cream Auto. 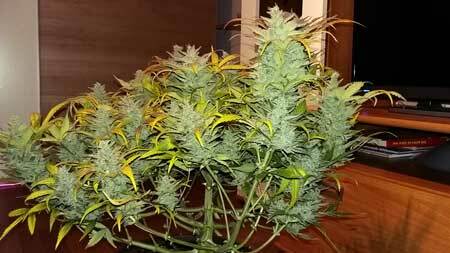 Over the last few years this breeder has really started becoming very popular for auto-flowering strains, and has made a name for producing amazing auto-flowering genetics. I’ve seen several beautiful examples of Mephisto Genetics in our forum but no one has formally submitted a picture yet! Send us your pics!